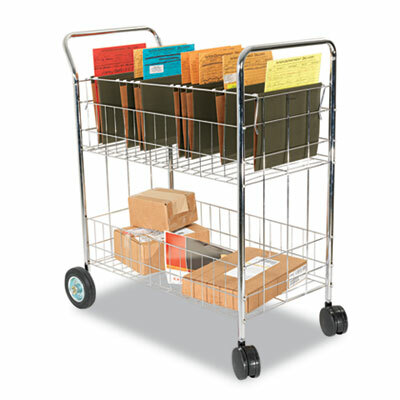 Mobile mail cart to sort and deliver all your mail big or small. Top basket can accommodate letter and legal size hanging folders. Heavy-duty steel tubing and wire withstands constant use. Two 4" front nylon and two 6" back rubber casters. Capacity (text) Capacity: 400 lbs. Caster/Glide/Wheel Type Two 4" Front Nylon and Two 6" Back Rubber Casters.